At our Community Vet Clinic, we offer free and low-cost neutering services. Our free and low-cost neutering services are available to everyone. We offer free neutering for bull breeds and cats eligible under the London C4 scheme. The neutering procedure offers a humane and permanent solution to unwanted litters and also reduces the risk of your pet developing certain cancers and other diseases. Your pet will also be less likely to develop unwanted behaviours such as roaming, spraying and fighting with other animals. It is a simple, quick and low-risk procedure - most animals will be in and out of the Clinic within one day. We neuter cats from the age of 8-9 weeks and dogs from the age of 12 weeks. We will always make an individual assessment of each animal before each procedure. Want to get the facts on neutering? A simple, quick and low-risk procedure - most animals will be in and out of the Clinic within one day. Please call or email to book your free or low-cost neutering appointment. Our Community Vet Clinic offers free and low-cost neutering for cats, dogs and rabbits. We are proud to offer free neutering for bull breed dogs. These breeds are often used as status dogs and are associated with overbreeding. In order to qualify for this service, your dog must have the physical characteristics of a bull breed or bull breed cross. Even if you are sure that your dog has bull breed parentage, they will only be eligible if they have the physical characteristics. The scheme incorporates bull breeds such as the Staffordshire Bull Terrier, English Bull Terrier, American Bulldog and Bullmastiff types. French Bulldogs are eligible for low-cost neutering but not free neutering. If you are unsure whether your dog is eligible, please call us on 02089 628017 for advice. Please note that the decision of the Veterinary Surgeon admitting your dog on the day of surgery will be final. If they decide that your dog is not an eligible Bull Breed or Bull Breed mix you will be asked to pay for neutering. This price is heavily subsidised by Mayhew and is at a low cost. We were the first charity to introduce a free Bull Breed neutering scheme in 2006 to help reduce the chronic overpopulation of these breed types and stem the number of unwanted dogs arriving at rescue centres. 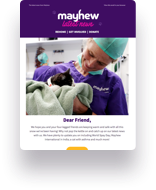 The scheme is free to all but Mayhew is grateful for any donations that can be made towards the cost of the surgery, enabling us to continue this vital programme. Proof that the owner is eligible must be provided on the day of your appointment. To find out more, please visit the C4 scheme guide. We also offer a free Pick & Snip scheme for cats and dogs. We collect cats and dogs, bring them to our Clinic for neutering and return them. Find out more about this scheme.